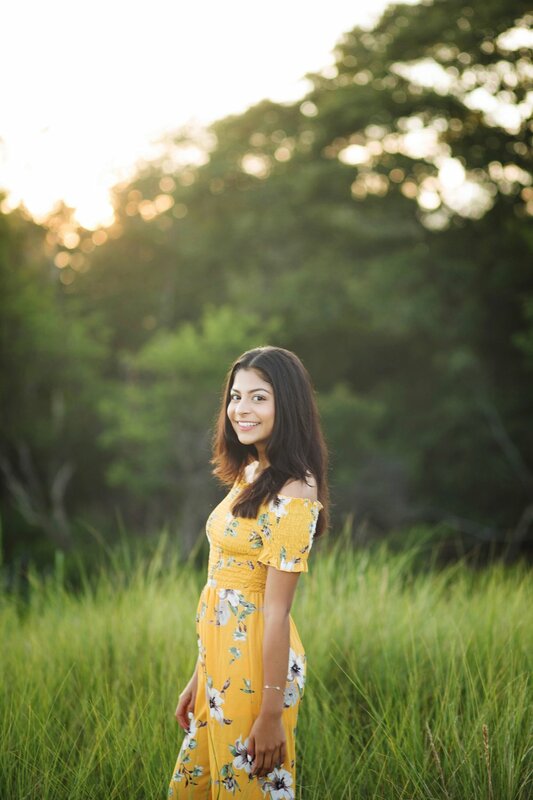 This absolutely stunning senior from Merrimack Valley High School chose a beach session for her full senior portraits - and what a great choice that was! MVHS senior portraits have never looked better! She pulled together an amazing grouping of outfits that showed different sides of her personality and gave her great variety in her images. The outfits were perfect for the beach location and we talked about how we could match each one to the different areas of the beach. I think we knocked it out of the park with this one! The best part of this session comes afterward... I was driving home and from the other side of the road, there was the most amazing sunset and I pulled off the road to try to grab a picture to include in her gallery for her. Sure enough, when I pulled in, this MVHS senior was here with her sister and her dad - taking pictures themselves! I love when I share the same vision with my clients! Fun, carefree and casual senior sessions are totally my jam! 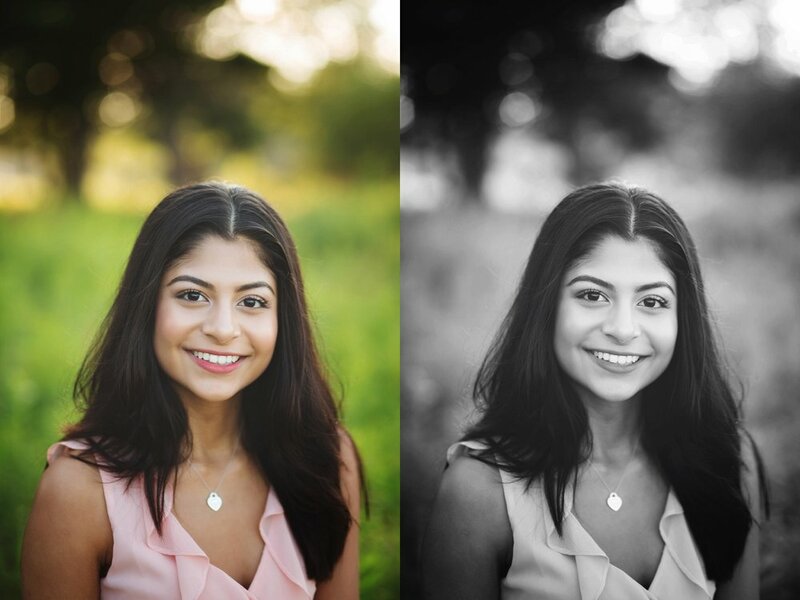 This wonderful senior from Alvirne High School in Hudson had an absolutely gorgeous night for her mini session. She came armed with an outfit change, her awesome family and her AMAZING smile - and we were good to go! 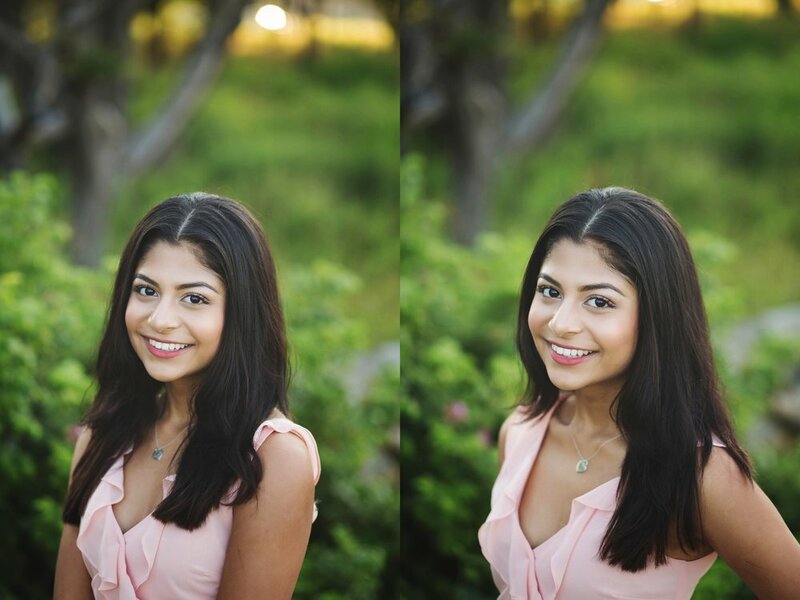 A mini session is a great opportunity to get a variety of images, along with an outfit change - and not break the bank! Parents will have plenty of images to choose from to decorate over their fireplace mantle - and my seniors always have tons of headshots to choose from. 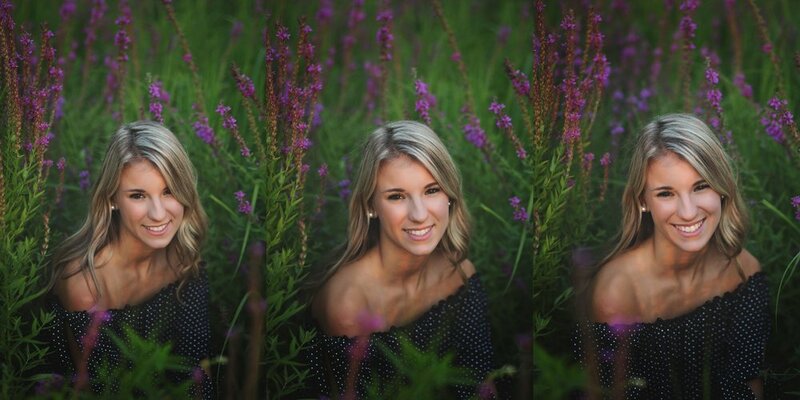 If you're interested in a senior portrait session for your senior pictures, get in touch with me! 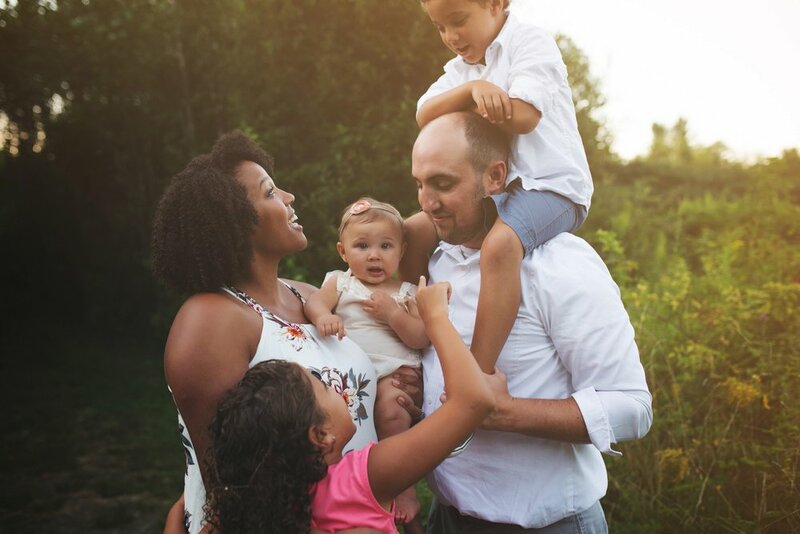 I'm happy to talk about full and mini sessions with you and figure out what the best option is for you and your family! 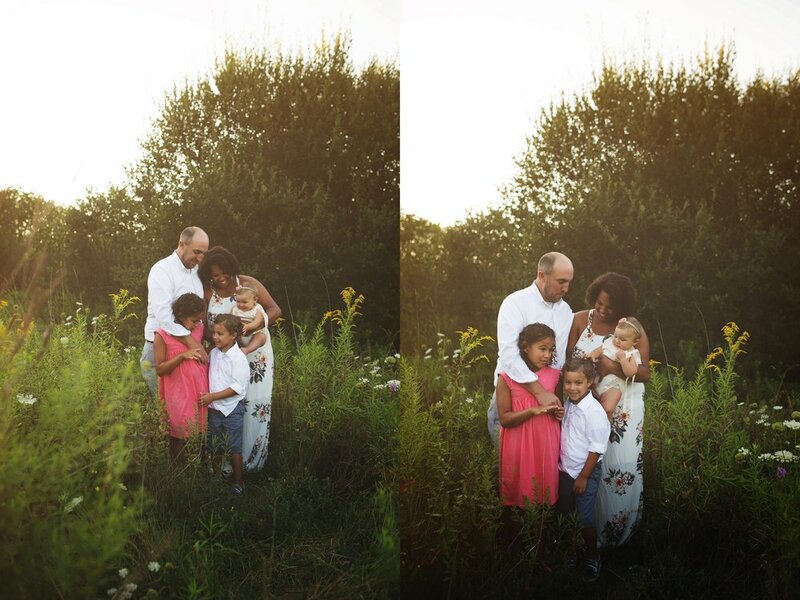 I absolutely adore this late summer session with this gorgeous family of 5. This mama totally rocked their outfits - the gorgeous romper on the little miss could have been the most beautiful one I've photographed. These siblings were so fantastic and adored their little sister. There was lots of talk about up-coming school - and of course, the goose poop that was all over the sidewalks! Late summer sessions like this one are perfect for so many reasons. First, the nights start to get cooler and we aren't wiping sweat off of you! Dads also appreciate the cooler nights so that they aren't sporting sweat stains in their images. (PS, guys - your wife will appreciate that, too). But, it isn't too cool to be wearing gorgeous maxi dresses and rompers for the girls, and shorts and shirts for the dudes. We aren't worried about getting the kids off to bed for school the next day, or unhappy kiddos after a long day of school. Kids and families are generally more relaxed during summer sessions. And let's face it - the timing of the session is perfect for getting ice cream afterwards! Score all around! Thanks W family for sharing your night with me! We were able to get this Amherst, NH Mommy & Me session in right before it rained and blew all of the amazing apple blossoms right off the trees! I was so thankful to have one of my absolute favorite returning clients and (beautifully talented in some many ways) friend come for these mini sessions that are held in the spring. I am so lucky to call this woman my friend and have for so many years. I have captured her pre-pregnancy, and then pregnant... and then I was able to photograph their family pictures last fall for Mr. H's first session. And now, I have the pleasure to seeing this on-the-move baby with his own plans and personality... they are truly wonderful to be able to shoot with my camera. The apple blossoms in Londonderry are such a gorgeous site and I love having a secret little spot to bring my clients to. My little friend here had just started to take his first steps, so lucky me, I was able to try to capture some special images for mom. He was MUCH more interested in the dandelions though! Thank you, O mama and little buddy, for trusting me with this session to capture your love. So many more people are interested in lifestyle photography here in New Hampshire, and I couldn't be happier about that! I absolutely love capturing families within their own environment. Kids are usually much more comfortable inside their own homes, on their own turf. And I love seeing them interact with their favorite toys, their little nooks and crannies in their homes and seeing their confidence when they rule the roost. Lifestyle sessions are easy-paced, slow going and freeze time - whether it be the quiet of only one in your house, or the chaos and craziness of 5! As I tell so many of my newborn and toddler lifestyle session families... as much as we don't want our homes and our kids rooms to change over the years, they do. Mobiles that hang over cribs give way to pictures that they draw... and will eventually have posters and photographs hang that we have no control over. While we have say in what their room decor looks like and ummm... how clean their room stays... let's capture these important moments. I had the good fortune to see some members of this gorgeous Londonderry family for the second time in front of my camera! I had originally done some family shots the year prior and then this past year, I got to meet the rest of the gang. I absolutely adore doing extended family sessions like this one! Reigning in the little one became a family affair for sure! Everyone was on the move trying to grab her for a photo. But as grandparents and loving family members always are, they were so patient getting her to laugh, and maaaaaaybe sit still - even if just for a moment - so that we could grab the picture. Thank you so much for trusting me with a session like this one! It was so great to meet the rest of the family who was as sweet as I had imagined!